ABT replacement multipoint door locking mechanisms and gearboxs to repair UPVC and Composite doors. ABT Replacement UPVC Door Locks - Often Found On St Helens Upvc Door Lock Mechanism. Replacement ABT UPVC door gearbox with faceplate and snib, the ABT UPVC Door Lock was widely used by St Helens glass as their door lock. This ABT UPVC Door Lock is a St Helens match replacement door lock that has a 32mm Backset. The ABT UPVC Door Lock is sometimes used on aluminimum doors as a centre door gearbox as well. 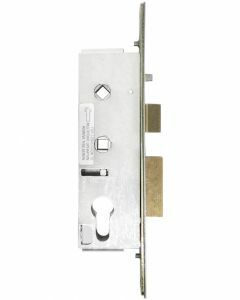 The door lock case suits old St Helens door lock as well as other suppliers, connects to top and bottom locking rods concealed in door jamb. Removal of the old ABT UPVC Door Lock case is somewhat fiddly as the top and bottom shoot bolt connector are screwed into the door lock plate casing. They are fed in through the top or bottom through a routed hole and screwed into place. We have found that if possible it is easier to remove the door sash and lay it on it's side so that you can get to either end.